After my 9.6v saw gave out right in the middle of an interior trim job (but after nearly fifteen years of dutiful service), I ordered this 14.4v version of my broken 9.6v saw. This new saw base plate is much different than the 9.6v version. The 14.4v uses thumb screw fasteners for all adjustments and is essentially a scaled down version of a standard circular saw. It even comes with a rip guide. I like it a lot. No more pulling off the hex wrench key for every adjustment. The 9.6v is a bit more svelte that the 14.4v cousin and easier to work on tighter jobs, but the 14.4v is noticeably more powerful. Both saws use the same blade and leave nothing more than a pencil line sized cut (which is nice, because if you draw a pencil line, that is exactly the width of material that will be cut away by the saw blade). And as was noted in another review, the saw speed (for both 9.6v and 14.4v) is considerably slower than any other saw you have probably worked with, but it cuts fine. During "built in" cabinet modifications where I made cuts without removing the cabinets, I routinely cut 3/4 inch material with the 9.6v saw. It was slow going, but I was never cutting more than a few feet anyhow. This is where the 14.4v does much better. I took delivery of the 14.4v saw and returned to finish the hall closet modification job I had been working when my 9.6v died (all 3/4 inch cutting). I took the blade right off my 9.6v saw and attached it to the new 14.4v saw and it cut like butter. I finished the remaining six or so feet in a just a couple minutes. One noticeable difference between the 9.6v and 14.4v is the saw table guide. On the 9.6v I would draw the cut line and use double stick tape to temporarily affix my aluminum straight edge right on that line. The 9.6v saw table edge was precisely parallel to the blade cut, and so the straight edge guide went right on the cut line. Pretty nice! The 14.4v saw table has about a 1/4 inch offset from the blade, so that small luxury was no more - but it was enough for me to also get my 9.6v saw repaired (only $45 at the Makita repair shop). If I had to have only one saw, I would think about what I would use it most for. When I bought my 9.6v years back, I thought it would only be for thinner stock. Looking back, I used it often for 3/4 inch material - certainly more than it was truly designed for. If I was certain that the saw was just for laminate or nothing more than 3/8 inch material and cutting would be no more than 15 or 20 feet per job, I would recommend the 9.6v version. If you know that you will be routinely cutting stock thicker than 3/8 inch and or more than 20 feet per job, then don't even think about the 9.6v saw - the 14.4v is for you. They are both great saws and I have yet to find anything that makes the clean non splintering defined cut of this 3 3/8 inch blade. I've had my eye on this saw for several months. Every once in a while I have a need for a small circular saw, so I finally took the plunge and bought it. My current project that I'm using it on is building exterior window casings out of 1x redwood stock. So far it's working pretty well. I'm able to cut a good 45 degree miter with it. I found that clamping a straight-edge to the stock helps as a guide to get a square cut. I have learned that in order to get a cut that is even semi-smooth, you really have to go slow with this saw (which is not a big deal). It can splinter the wood pretty easily. For exterior trim, I don't mind sanding it a little and after a little caulking and paint, I don't think you'll ever know. I don't think there's anyway I would use this saw for interior trim work. In my opinion it is a little overpriced, but I don't regret buying it. It's really nice not to get out my big corded circular saw when you just want to make a small, quick cut. I have owned this saw for 2-1/2 years, and have come to find its unique capabilities indispensable. Having said that, I can understand why some people would have problems with this tool - it is not for everyone. All battery powered tools must compromise between power, size and weight in order to achieve freedom from a 120V cord. This one is no different. It is a very small, very light tool. Its blade spins slower than other battery powered circular saws. Temper your expectations accordingly, expect it to cut at a relaxed rate, and you will be satisfied with it's performance. Assume it should be able to cut as quickly as a saw weighing 3 times as much, and you will be disappointed. I do a lot of woodwork and home renovation. I own many professional quality tools including a total of 4 circular saws. Two are 120 volt models, and two are battery powered. The other battery saw is an 18 volt Bosch with 6-1/2" blade. o It is lighter and smaller by far than any other circular saw. I easily operate it in one hand and SAFELY make cuts in places where no other saw can go. Situations where it has been especially useful include working overhead, sometimes perched atop a high ladder; working in a cramped crawlspace; removing plywood and OSB sheathing material from the wall of a house, cutting trim and siding material. o It's power to weight ratio, and perhaps more importantly power-to-saw-kerf ratio is far superior to most, if not all other battery powered saws. While my 18V Bosch sometimes stalls during heavy cuts, this little Makita has never, ever stalled. Like any circular saw, it will kick back if mishandled, however the result if much less forceful, and hence less dangerous which is important when working overhead or on a ladder. o Low noise level. By far the quietest circular saw I own. No hearing protection is required when using this little saw (the only exception is that sometimes the material being cut may make a racket, but it does not happen often). o Clean. Because the kerf is so tiny, this saw generates far less dust than any other power saw. The low speed of the blade ensures that little of it is blown into the air. I estimate more than ninety percent of the wood dust remains on the workpiece where it can be easily vacuumed or bushed away. 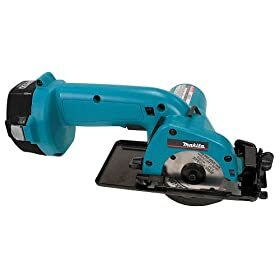 When working inside a house this is the cleanest power saw I have, even cleaner than a jig saw or a miter saw connected to a dust collector. o Battery life is very good. You can do a lot of work with this tool before needing a recharge. Also, the NiMh batteries can be recharged at any time without harm and, if you are in a hurry, they can be partially recharged and used. o Reasonable cutting capability. As mentioned previously, cutting occurs at a relaxed rate (although far faster than you could do by hand). This saw will readily cross cut one-by boards such as 3/4" thick fir or pine. It also nicely cuts sheet goods. I have used it extensively on half inch thick OSB, as well as fir, pressure treated and Baltic birch plywood (Baltic birch is essentially solid hardwood). I've used it less often on thicker sheet goods but it certainly does cut 3/4" thick stock, although a bit more slowly than the half inch stuff. As with all circular saws, the underside cuts very cleanly, with the only tear out on the top side (although the tiny kerf limits this to an acceptable level for most work - use masking tape or other methods if required). o Tiny diameter blade makes it possible to plunge cut closer to the line than larger blades can. For example if you are cutting half inch thick sheathing a 7-1/4 inch blade will be 5/8" beyond the point that the 3-3/8 blade will be when you stop the cut. Sorry if this seems obscure - it is difficult to explain without a diagram - perhaps if sketching both diameters it will clarify things. Practically speaking, it means I can use this to make rough cut outs in sheathing or other material where I would normally need a different kind of saw (like a Rotozip, or jig saw). 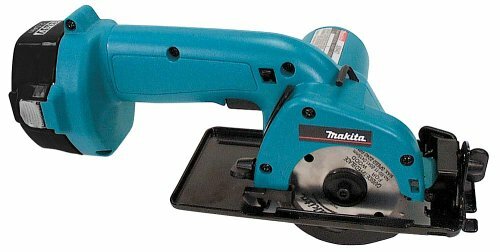 o While it is ruggedly built, and very durable (like most other Makita tools), the baseplate is simply folded steel. It works, but a solid aluminum alloy baseplate ought to be standard in a saw of this price range. Also the pivot points are not quite as tight as I would like, so there is just a little slop when adjusting the base height or angle. In summary, this is a rugged, useful tool. I know of no other circular saw that can compare to it in terms of size and weight. I use mine often, and would not be without it, especially for construction and installation work. This thing is great. It won't do everything a big saw can do but it can take care of many jobs. Being cordless makes it just so convenient and takes the hassle out of setting up for small household projects. Cutting thin material takes a little extra time and care to get a good clean cut. Cuts right through 3/4" plywood. Works well for what it is. However, don't bother trying to do a 45 degree angle cut on anything thicker than 3/8", or maybe 1/2". It won't cut all the way through. I tried making some moulding out of 3/4" thick wood, and found that the saw only went 2/3 of the way. For straight cuts, it's great, makes a smooth finish. Is it worth the price? Probably not, unless this is exactly the tool you need. You may be better off with a larger saw, which will undoubtedly be cheaper as well. This is a very cool little saw, handy and well designed for thin stock, and no one but Makita makes anything like it. Only wish it took the same 18V lithium batteries as my other Makita tools - they make way too many battery types. Yes, I read a lot of reviews on this saw and the cheaper one and glad I went with this one. Although not the high speed of larger ones, I have used mine on drywall, wood, molding and backer board and all with the stock blade so I can't complain. I really didn't think it would do that well because you know you can't afford to buy cheap tools and for $178 it was well worth it. Not many Mfg's make this size saw and it' s nice to have. Wish DeWalt would make one..